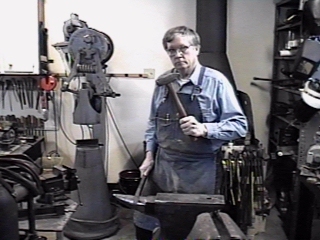 I, Pete, began blacksmithing in earnest in about 1986, although I have worked with metal since I was 7 years old. And I have been learning the craft of the blacksmith ever since. Now it's time to give back some of what I have learned. In 1986 I joined the Guild of Metalsmiths, a Minnesota/Wisconsin blacksmithing organization. This Guild is now well over 30 years old and has a liberal sprinkling of mentors. After "taking" from the Guild of Metalsmiths through mentorship, through its formal blacksmith education courses and through general networking for a year or so I became active in Guild management. I chaired the program committee, took over database management and then the vice presidency including the job of recording secretary for many years. I have co-taught a couple of levels of basic blacksmithing and have written for the Guild's quarterly newsletter, "The Metalsmith". A nice heated blacksmithing/metalworking Shop has grown up on our place over the years and to date I have collected and made a lot of blacksmith tools. Seven of these tools comprise my collection of 25# and 50# power hammers (or trip hammers, as they are often called). (See "Powerhammer"link below). My wife Sheran supports me constantly in blacksmith guild work. She is deeply into fiber arts and crafts and is currently quite involved in the spinning of wool using traditional 17th to 19th century techniques. Several years ago we began demonstrating our crafts as a pair, often dressed in 1870's costume. How much does that piece of steel Weigh? Hooks, What makes a "hook" a "hook"?